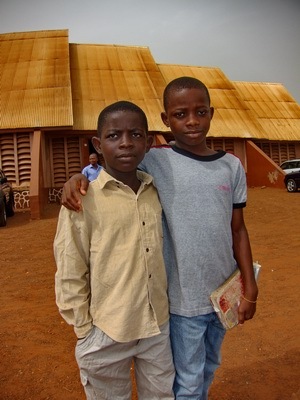 During my June and July 2010 trips to Ghana I had some surprising, interesting and informative experiences in church. In a beautiful church building in the town of Tamale (shown on right), they took a count of those attending by age and gender. When an age and gender group was called out, such as all men over 40, all those in that group had to stand while they were counted. Those counting called the number to the front where it was recorded and then that group could sit down. Then another was called and so on. I don’t think that this one will work in churches in the US, at least not for the ladies. 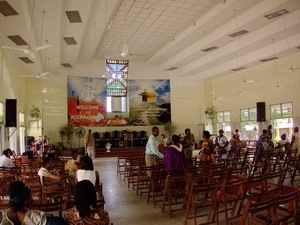 Visitors were asked to go to the front and stand facing the congregation. We were asked to say our name, where we were from and why we were there. It was rather odd to walk up to the front and stand facing everyone. In southern Oregon, a church known for this would not get many visitors! But the Ghanaians, both visitors and the others, really seemed to like it. I think that there is a genuine interest in knowing the visitors and that the visitors want to be known. We were asked to break up into “Day-born groups”. At firs I did not understand what I was hearing. When I asked, I was informed that they are groups to raise money. Everyone belongs to one according to the day of the week he or she was born on. I had no idea, but I looked it up my birthday on my phone and found out that I was born on Tuesday. Everyone else knew. In June, the World Cup was happening and the Ghana team was still in the running. During the prayer time we were asked to pray that the Ghana team would win. The leader was quite insistent that prayer would cause the Ghana team to win. There was a titter of laughter through the congregation as he went on. In some parts of Africa such laughter indicates unease about the statements being made. I was later able to confirm that was the case here. In the capital Accra (Accra Chapel in photo) and in Tamale the church service was suspended right in the middle for “Christian education”. The congregation broke into groups which were like Sunday School classes. They lasted about 40 minutes, then the church service resumed. In one of the churches, there was a special class for visitors. The lesson was a mixture of “what is a Christian” obviously for leading visitors to Christ, and “what is the church” aimed at helping visitors considering this church as their home church. On another Sunday, the Christian education was from Nehemiah 5:1-20. The teachers asked the class the question “What can we do to prevent injustice?” He then added that we should answer only for injustices within the church because injustice in politics “can only be changed through prayer”. The taking of the offering is a joyous moment involving dancing to the front in a line accompanied by music. One Sunday the music team started singing “Jesus is the Sweetest Name I Know” for taking the offering. The worship leader stopped them and got them to do something much more up tempo. It worked. Just to be clear, the church services were not just full of stuff I found odd or interesting. There was a lot of great worship and teaching that made me feel connected to the worldwide body of believers. This entry was posted in Christianity, Ghana, Humor, Religion and tagged church, church in Ghana, Ghana. Bookmark the permalink. We do the visitors stand up in front and say their name, where they are from, etc. 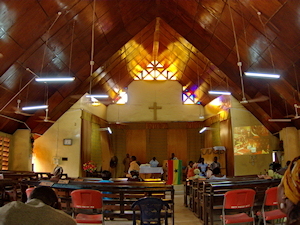 in just about every Deaf church I’ve visited in Africa!